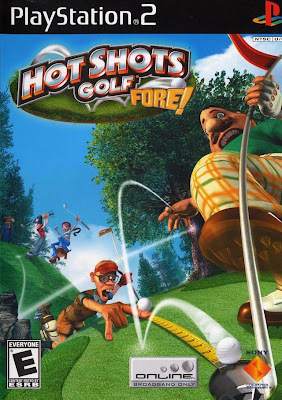 Let's continue this PlayStation-themed week with a retro review of Hot Shots Golf Fore! This game may just be my favorite goofy golf game around. Let's find out as we check out this all-new review. 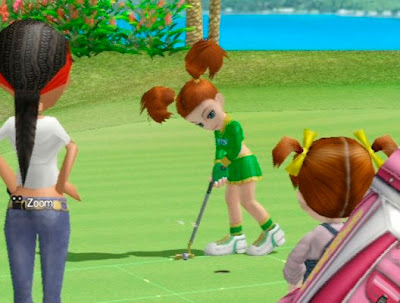 Cartoon golf is a genre heated with competition. There's Mario, Pangya, Outlaw Golf, and then there's the veterans of the genre, Hot Shots Golf. The gang is back for another round on the course with a cast of new characters, courses, and options including at one time online play. With enough holes, fun, and laughter all coming from one game, Hot Shots Golf Fore may just sink that ever-elusive albatross. Hot Shots Golf Fore! is packed with content and options. Firstly, there's twenty-four characters in all to start with including a stereotypical cheerleader, stoner, and precocious young girl, but there's also Jak and Ratchet from their respective Sony game series. You start out with four characters, and you unlock the rest in VS. mode where you compete one-on-one against a character in a nine hole face-off. Win, and you unlock that character for use in any mode of your choosing. There's also a hard version of each character where winning unlocks a special costume for said character. It's not as simple as just playing nine holes against a computer opponent. Sometimes there will be special rules involved such as hitting it in the rough or sand equals a two stroke penalty or the course that the round that will be played on is predetermined. Each character in HSG4 has their own stats, strengths, and weaknesses like being good in rough and being poor in rainy conditions. 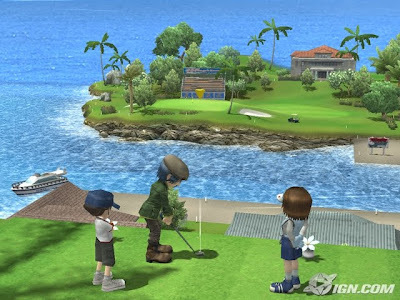 Then there's the Tournament mode where players play 18 holes on a course of their choosing, aiming for the number one spot each time around. Completing a tournament wields big rewards such as course experience points. Earn enough experience points, and you unlock the next rank. Complete the entry requirement for said rank, and you advance to it. These requirement matches usually have you playing against no one but yourself as you try to score above a set score such as +4 or -1. There's numerous ranks to achieve unlocking progressively more difficult courses and tournaments. Additionally, there's several other modes to challenge yourself with. If your game has got you down, you can always scope out the training mode that allows you to set the conditions of the hole. From wind to weather, there's something for everyone in training to adjust. If the big version of golf is too taxing, you can try the mini-golf mode which has two courses of nine holes. Then there's the short course of eighteen holes-- all par threes. Finally, there was the once lively online mode. 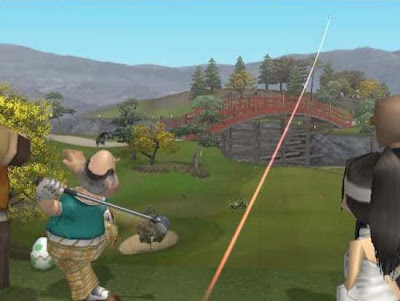 Unfortunately, if you want online in your Hot Shots Golf experience, you'll need to upgrade to a PlayStation 3 and a copy of Hot Shots Golf: Out of Bounds as the online here is now defunct. Furthermore, there's even a video recorder to capture your best shots so you can watch them over and over until your eyes turn red. As you play through the single-player modes of Hot Shots Golf Fore!, you earn points based on your course performance such as earning birdies, eagles, chip-ins, pars, and more. These points can be used in the game's shop where a wide assortment of goodies are available to get your consumerism on. There's new club and ball types from the extra-helpful to keep the ball on a straight path, the straight ball and club to the extra-strength using big-air set of clubs and balls. The store is also where you can purchase new caddies as soon as they become available like the hilarious Scotsman Greg whose useful caddy advice ranges from "hit it in, pudgy" to "the last hole is last". There's also two familiar caddies from both the Jak & Daxter and the Ratchet & Clank series, the wise-cracking Daxter and the ultra-intelligent Clank. twelve courses in Hot Shots Golf Fore! There are twelve courses in all in Hot Shots Golf Fore!, and some of these are returning favorites while most are brand-spanking-new. There's several that lie on the foot of tall mountains such as Mt. Fuji while others take place in England, the sunny shores of Hawaii, and in the feudal zones of China. Each course has great variety, well-designed courses that are fair while simultaneously being tricky, and numerous opportunities to experiment with your characters. Golf is a fickle sport. Sometimes you'll have the game of your life while the next you'll have your worst performance yet. It's all about learning the intricacies of the game and the game's controls. Hot Shots Golf Fore! uses the traditional three-click system. One button press starts the meter towards the left end of the gauge, the second sets the power of the shot, and the third sets the accuracy of the shot. Holding the d-pad while hitting sets whether or not you're giving the ball backspin, topspin, or drawing or fading the ball to avoid obstacles such as trees. There's many factors to consider when making a shot which can feel overwhelming at times. There's incline, slope, wind velocity, lie of the ball, and weather, for starters. If the wind is blowing far to the right, you'll want to aim more to the left to compensate. Your long game is just half the equation in golf. There's also your short game to consider. You can hit the ball on the green in one, and it won't matter if you're a lousy putter. On the green, arrows run down it, indicating its slope and slope speed. The later courses are full of tricky hills, problematic putts, and fast slopes. Instead of hitting the gauge thrice, you just need to start the gauge and select the power of your shot based on the slope to the hole. To put it bluntly, both the long game and short game takes practice to master, but once you do it is greatly rewarding. There's no better feeling for a golfer than sinking a forty-foot putt over rough terrain. Cheerleader Phoebe hopes her aim is true. Hot Shots Golf Fore! is a graphically competent PlayStation 2 game. It obviously looks dated compared to current-gen games, but it won't hurt the eyes too badly as it still holds up well. There's little in the way of slowdown to worry about, and the courses and characters animate smoothly with little touches here and there such as ants marching around the rim of the cup and tumbleweed blowing across certain courses. The music is very memorable, and it doesn't do much to distract from a player's round. The voice acting is particularly cheesy, but it's perfect for a game like this that doesn't take itself seriously. Overall, Hot Shots Golf Fore! is a presentable package fitting for the PS2. Ratchet ditches Clank as a backpack for a bag of clubs. Ultimately, Hot Shots Golf Fore! does a lot better compared to previous entries in the Hot Shots Golf franchise and even most of its competitors. With 24 unique characters, 12 dazzling courses, and a bevy of bountiful options, HSG4 is an extremely capable golf game. 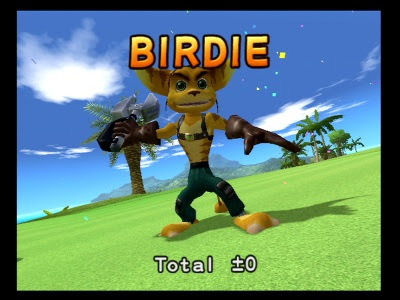 It may feel too unforgiving for newcomers, but veterans of the franchise will definitely appreciate this awesome golf game. That patented Hot Shots Golf charm is here, that accessibility for most players is around, and the trademark humor is easy to spot. For a rip-roaring good time on the green, look no further than Hot Shots Golf Fore!